Get ahead of the holiday rush by using these tips to develop a strong eCommerce holiday plan that will maximize your revenue growth. Welcome to part 1 of our eCommerce Holiday Preparation blog series! In this four-part blog series you’ll learn tips and tricks from eCommerce experts on how to get your business ready before the busy holiday rush. Check out Groove’s eCommerce blog every Tuesday in the month of August to get guidance on several aspects of planning an eCommerce store for holiday success. For many etailers, the holiday season is the busiest time of year because it generates so much revenue for their businesses. According to Statista, in 2015, holiday season retail eCommerce revenues are projected to amount to $82.4 billion — a 14.4% increase from 2014. In order to prepare for what is sure to be a hectic season, let’s take a look at how you can start preparing your holiday eCommerce plan now in order to maximize your revenue growth. Which holidays, whether made up by the online world or noted on the calendar, are your business going to participate in? This is a very important question to answer before planning your eCommerce strategy for the holidays. If you’re not sure where to start to determine what holiday to market around, take time to look at your past holiday campaigns to see how successful they were, and look for spikes in traffic during the past holiday seasons for opportunities. If this is your first time doing a big holiday strategy, we recommend targeting some of the major etailer holidays such as Black Friday, Cyber Monday and Green Monday. According to the 2014 Adobe Digital Index Online Shopping Report, consumers spent $2.4 million on Black Friday. With many of these established holidays being peak online shopping days, it’s a great idea to include your promotions around those times. Once you’ve nailed down which holidays you’re going to participate in, a good next step would be to plan out your promotional calendar. It’s more than likely that you and your team will be focusing on so many different business aspects during the mad holiday season, so staying organized with a promotional calendar will be crucial in helping you reach your goals. 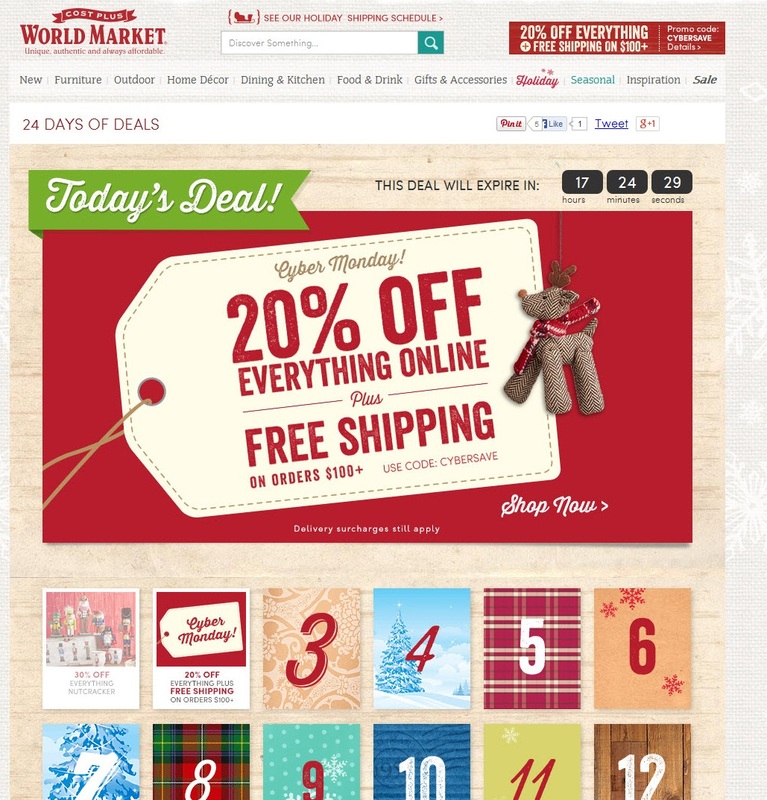 How detailed or how many promotional calendars you make will depend on how many eCommerce holiday strategies there are. 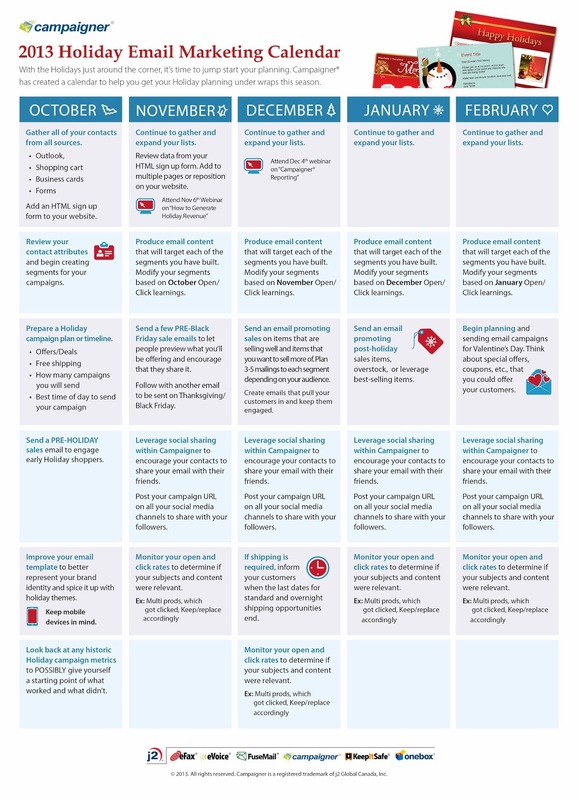 If you are looking to run a longer campaign that runs for several months, check out this great example from Campaigner highlighting a holiday email marketing calendar that runs from October to February. Everyone is looking for a great bargain during the holidays, especially on Black Friday and Cyber Monday. How are you going to promote your website and the items you’re selling? You’ve already set up your promotional calendar. Hopefully it included the types of emails and PPC ads you’ll be crafting in the coming months. These two advertising strategies are the quickest ways to get in front of your customers and boost sales. Sending a series of emails leading up to Cyber Monday and then a final reminder the day of is a great technique we’ve seen success from in the past. Making sure you have well-optimized PPC ads running is also a great idea. PPC is one of the best advertising techniques to prove ROI with real numbers instantly, and is a great way to get in front of the right audience. That means you’re missing out on 80% of the users who will land on your website! The Internet allows consumers to be patient, and they are willing to spend time looking for the cheapest options. Free shipping has the potential to make your website stand out from the next. If you’re a smaller etailer and free shipping will have a big impact on your overall revenue, you could always offer it on a certain dollar figure. For example, you could offer the consumer free shipping on orders over $100, or the amount that makes sense for your business depending on the type of products you sell. As the rise in smart phones and tablets continues, it’s important now more than ever that your website is mobile-friendly. According to Marketing Land, a 2014 ComScore report showed that mobile commerce jumped 28% to $31.6 billion, outpacing desktop, which grew by 13% to $236.9 billion. Throughout the 2014 holiday season, one out of four online purchases took place on a smart phone; that’s up from 18.6% during the 2013 holiday season. With eCommerce sales from mobile and tablet devices rising, businesses can’t afford to skip out on optimizing their stores as an essential part of their online selling strategy. Not to mention Google’s recent algorithm update penalizes non-mobile-friendly websites. Don’t let an iPad or mobile user slip through your fingertips because your website shopping experience isn’t mobile-friendly. This isn’t something that will blow the socks off your customers and help increase your conversion rates significantly, but it is something that will be a bit more aesthetically pleasing to your website visitors. Incorporating holiday graphics and texts will be sure to get your website visitors in the holiday state of mind. To help ensure your increased holiday traffic results with more frequent sales, you want to take some planning time to optimize your merchandising. Going along with adding holiday aesthetics, you also want to make changes to the site to help your frequent visitors and new users explore your website. A great place to begin would be to strategically organize your products to encourage holiday shopping. You can do this through changes in the navigation and how you organize product categories. Look at how your products are laid out into categories and consider adding holiday-specific categories such as “Holidays” or “Gifts for Men.” Don’t forget to enhance your holiday strategies with details like using attractive product photography, product information and color options. Not sure which of your products would be ideal to highlight in a holiday-specific category? Take a look at your analytics to see which items were popular during the holidays last year and look for opportunities to feature these products more predominantly this year. When approaching your promotions and merchandising, try to get inside the customer’s perspective — more specifically, a first-time customer perspective to ensure the best possible customer experience. What is it that our customers are looking for? Is it easy for first-time users to navigate the site? How can we help them find what products they are looking for? Do our product descriptions make sense to those unfamiliar with our products? What kind of experience are our customers looking for on our site? These questions will help you and your team look for opportunities to enhance your merchandising efforts for the holidays. After all, having a seamless way to navigate through your site is not only crucial to increase your conversion rates, but extremely important when it comes to creating a customer experience for those who normally don’t visit your site and are shopping for others. Many people buy gifts for others during the holiday season and visit businesses they normally wouldn’t be shopping from. Create a holiday experience that not only your regulars love, but one that new visitors find trusting, is easy to navigate through and turns new visitors into customers. This may also sound like a given, but be sure you have your inventory ready to go for the holiday season and that your vendors will be able to supply your demands. One of the most overlooked things companies forget about heading into the holidays is the need for increase website security. As the amount of traffic that comes to your website during the holiday season rises, so does the amount of hackers trying to break into your site. If your site is down for any amount of time, depending on the size of your business, you could be losing thousands of dollars by the minute. A couple things you could do to your website in order to make sure you’re fully protected include performing a security audit, making sure you have a secure connection, and making sure your trust seals are on display to help worried consumers feel more at ease in giving you their credit card information. Yes, I understand it’s summertime and you’d rather be lounging by the pool than thinking about planning for the holiday rush. However, thinking about these things when work can be a bit slower is a great way to get ahead and take advantage of the busy holiday season. Who knows — maybe the extra planning exceeds holiday expectations and helps you work your way towards that promotion you’ve been aiming for. Interested in learning more about how you can prepare your eCommerce store for the holiday rush? Stay tuned for the second blog in our eCommerce holiday prep series to learn about how to maximize your email marketing strategies! Looking for some extra help with your holiday marketing plan this year? Contact us today! We’d love to chat about how we can supercharge your inbound marketing efforts!